A separate companion app for Twitter, #Music is aimed at encouraging you to follow bands, to tweet their most popular songs, and to help use Twitter to both measure and boost the popularity of today’s musicians. While giving you a tool to discover what your friends are listening to, it would seem that Twitter hopes to become a launch tool for new bands the way MySpace was during its heyday. At launch the app is a bit tentative, as if Twitter is still working things out. There are feeds devoted to popularity (what’s trending), now playing (songs your friends have tweeted) and recommended for you (based on bands you follow). Each of these can be played like a streaming radio using a pop-up music player with clips grabbed from iTunes or Rdio (if you are a subscriber). The tricky part is in trying to tweet music yourself. It should be an obvious thing to do, but it isn’t. 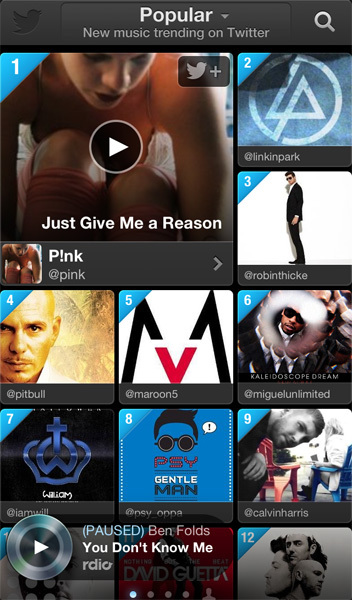 You can retweet any of the songs listed in the feeds or search for bands to follow. Once added to your followed list, you can then tweet a single song associated with a band’s Twitter account. If a band doesn’t have a verified Twitter account or one recognized for music content, you can’t tweet their music, and if you don’t like the one song being offered, you’re out of luck. Obviously this isn’t how you’ll want to use their app and so while Twitter has made an interesting move here, and one thankfully that is about discovering new music instead of selling it, they still have a lot of work to do before it becomes an app you’ll use every day. 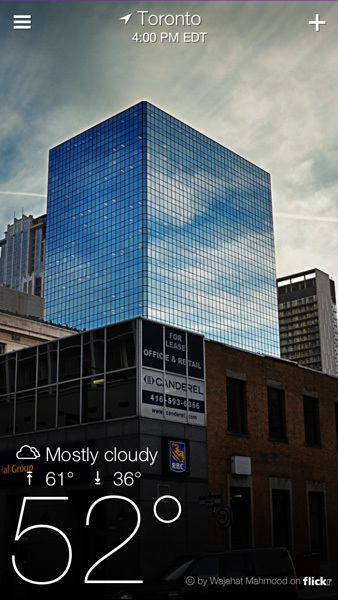 Each time you open this app you’ll find a weather photograph submitted by a user. Picturesque views of city buildings, mirrored against clouds in the sky or golden fields swaying in the wind. These images are chosen to match your location and time of day and are loaded as wallpaper images behind floating, animated weather forecasts. The weather data is expressed with beautiful iconography that detail weekly weather forecasts, “feels Like” measurements with measurements for humidity, visibility, precipitation, wind speed & pressure, and cycles of the sun & moon. The animated windmills and personalized maps and a nice touch and combined with everything else make for one of the finest weather apps I’ve seen. 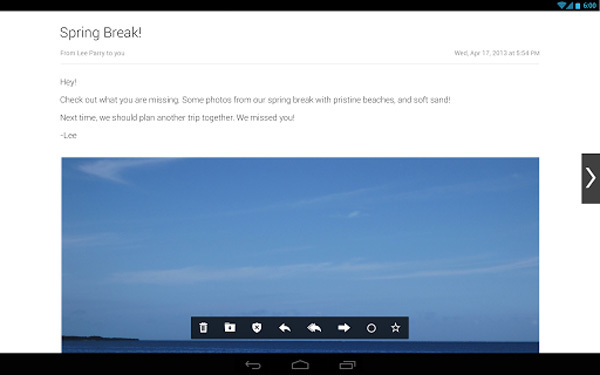 Newly updated for tablets, Yahoo Mail matches the look and layout of the web browser version, but when you open an e-mail and make it fullscreen, you can swipe to flip through your inbox like a magazine, turning e-mail messages as if they are pages. The idea is to make it easier to organize your inbox and browse through your mail, although it’s still limited to managing just one account. John Buchan’s classic thriller is given a dramatic re-enactment with this special edition that has the opening credits and musical score of a movie, the interactive rooms and objects of a video game, the vocal performances of an audiobook, and the reading passages of a novel. 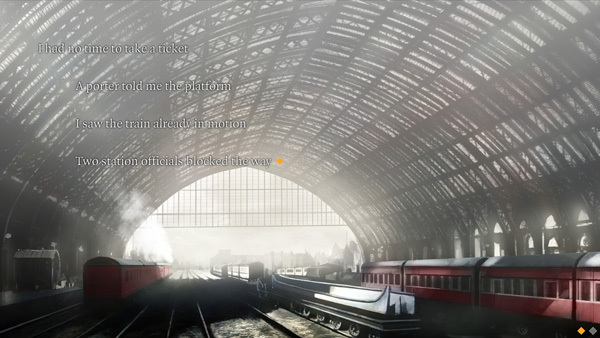 It’s not a game, there are no choices to make, no alternate endings, but simply an atmospheric version of the book aimed at helping your imagination bring to life the London of 1914. When a neighbour asks Richard Hannay to help him fake his death, it leads him down a twisting path of murder, mystery, and intrigue. While the app uses maps, handwritten notes, and interactive clues to make it easier to visualize the movements of the plot, it avoids giving characters faces so you can still form the way they look in your head. It moves at a book’s pace, with you flipping through phrases of text like pages, and requires the same kind of patience and focus. That loyalty to a book’s nature is bound to disappoint anyone looking for a faster movie or game-like experience, but means it should be a nice surprise for bibliophiles looking to try something new. 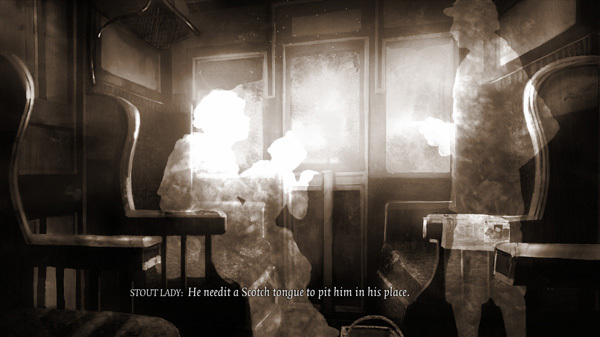 Some elements work better than others, such as the audio track and animations overly the ghostly actor apparitions, but it does come together to make for an atmospheric journey. I hope publisher Faber & Faber adapts more of this titles this way as there’s certainly an approach here that should evolve.